Challenger Lifts CL10V3-DPC Versymmetric® 2-post car lift w/ Dual Pendant Power Controls directSPOT™, offset 3-stage front & rear arms & dual single-point mechanical lock release. Includes Stack Adaptor Kit (Part #10315), Document Caddy (Part #10320) and Pendant Holder (Part #10321), (11′ 11″ ht. at full stroke) (Single phase only). 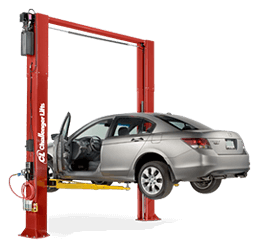 Versymmetric® offset front arms provide directSPOT™ to vehicle lift points and safely lifts both symmetrically and asymmetrically within the same service bay maximizing service capabilities and revenue potential. Padded overhead shut off system prevents vehicle damage from being raised too high Oversized 5″ diameter pulley and heavy duty 5/16″ cable reduces stress on equalization system and increases cable life. Fully gusseted base plate design reduces column deflection. 48″ elongated carriage design decreases load on bearing. Single point mechanical lock release system with jacket coated protection and no lock cable pulleys, and double clutch release bar protects cable from stretching while disengaging both column locks simultaneously. 11′ 8″ standard height with 2′ and 3′ extensions available allows lift to be placed in standard service bay with 12′ ceiling. Rubber door guards provide added security against vehicle door damage. dual pendant power controls expedites vehicle spotting by providing an unobstructed view to lifting points OSHA compliant keyed lockout safety button locks out power to the lift. Up power button raises lift. Down power button / dual single-point mechanical lock release system lowers lift from either column.